improvements for 2019 in terms of coach and player development. For player development we are restarting the Seaforth FC Academy. Details about the Academy are below. For information on our coaching support and development initiatives, check out the development goals we’ve set up in our Skill Development Objectives, our other Coaching Resources and the details about our new Coach Development Team. In 2019 Seaforth FC will be establishing a new Development Academy with two exciting new options for our members. The ‘Academy Team’ program is intended for teams in the U8 to U14 age groups. This allows a team to train within the Academy environment, combining the team’s regular training session with an academy training session once per week. Often working with the teams regular volunteer coach, the academy session adds further detail to the training sessions promoting additional knowledge around the technical and tactical aspects of the game. Team Training is a 24 week program running from early March until the end of the season. This program is open to any player from any team from age groups U8 – U14. The program works with ability and age appropriate groups focusing purely on the technique aspect of the game. A lot of the time players will find themselves with one ball each working on ball manipulation in a small group or small sided setting. Maximising touches on the ball, sessions are intense and heavily assist in enhancing the player’s technical base. Skill Development Training is run on a term basis. The 8 week program will run once a week on either a Monday or Wednesday. In 2019 this program will commence in Term 2 and run through to the end of Term 3. 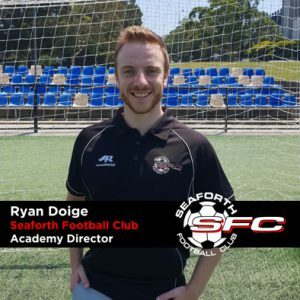 Seaforth FC is excited to announce that our new Seaforth FC Academy Director is Ryan Doidge. Ryan comes in to the role with a wealth of coaching experience. Before moving to Australia, Ryan worked in the USA with Major League Soccer side the New York Red Bulls within their pre-academy, working with youth players 12 years and under. In Australia Ryan has worked with National Premier League sides and has also worked on behalf of some A-league clubs. Most recently Ryan left a role with the Western Sydney Wanderers after working with their W-League team. Ryan currently also works as a Technical Director at another club where he established their academy program and will bring this knowledge and experience to add a level of professionalism to our club through our new academy structure. The Academy is open to anyone or any team who wishes to improve. There is no trial process required to participate in our academy. For our Team Training service, our hope is that all team members would join up to maximise the development to the team. However should any team member choose not to participate there will be no impact to game time, other training opportunities or any other team activity. Academy sessions will be held at Seaforth Oval on Monday and Wednesday evenings. Details of Academy pricing and other logistics will be available soon.